London’s Trafalgar Square will host a vigil in solidarity with the victims of Wednesday’s Paris shootings in which 12 people were killed. Similar events are being held in other cities around the globe. Promoted by a spontaneous social media campaign, the London vigil is taking place alongside similar gatherings across the world. “Against all forms of hatred, the defense of freedom of expression and peaceful tribute to the memory of the victims will be the only two unique demands of this rally." 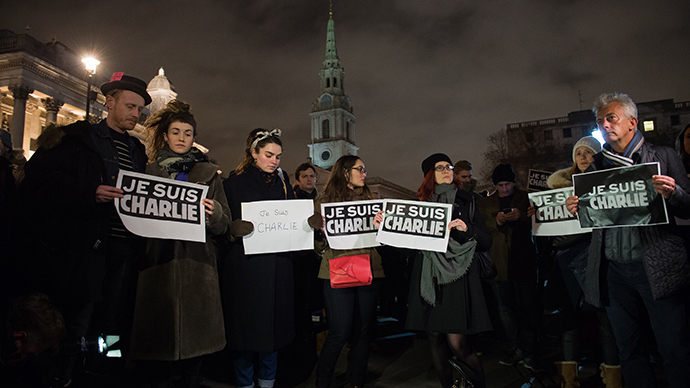 Organisers of the Trafalgar Square vigil ask people to bring signs reading “JE SUISCHARLIE” and drawings from Charlie Hebdo. People have also been encouraged to bring flowers and pens “to celebrate freedom of expression," andhave been askednot to bring candles for security reasons. Participants are assembling at the North Terrace in Trafalgar Square. Journalists in Paris organized a similar event in Place de la Republique which started at 6pm local time.